Nidorina in game: 804 Who? Important notice! Pokemon Nidorina is a fictional character of humans. She evolves from Nidoran♀ starting at level 16 and evolves into Nidoqueen when exposed to a Moon Stone. She is related to the Nidoran♂ line, but unlike Nidoran♀, Nidorina cannot breed. 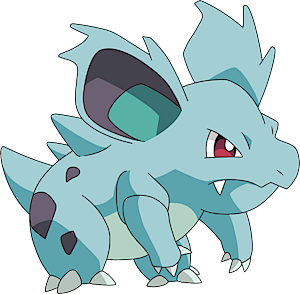 Nidorina is a quadruped, light-blue Pokémon with darker blue patches. It has red eyes, large, spiny ears, and has two pointed teeth protruding from its upper jaw. 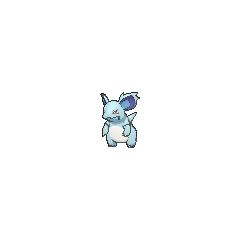 It possesses large poison spikes, which it retracts when with a group and while resting in its burrow. Its paws have three claws each, and it is able to stand on its hind legs. The hind legs are longer and thicker than its forelegs. It has a stubby tail. This is a female only species; the male counterpart is Nidorino. 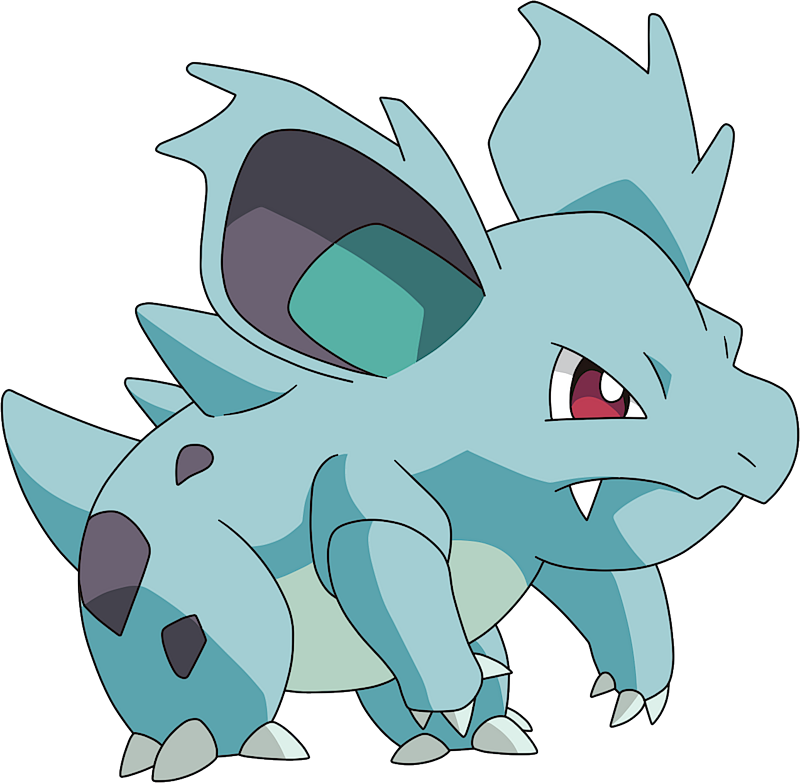 Nidorina is a gentle Pokémon, known to be a caring mother that chews food for its young. It seems to display close family bonds with others of its kind, and becomes nervous when separated. 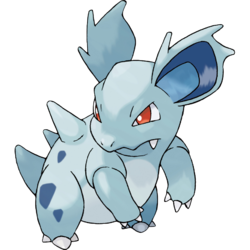 Nidorina prefers not to fight since its horn grows slowly, but if forced or enraged, it prefers physical attacks such as clawing and biting. It also emits ultrasonic cries to befuddle foes. Nidorina lives in hot savannas and plains. Emily's Nidoran♀, nicknamed Maria evolved into Nidorina after battling Team Rocket and kissing Ralph's Nidoran♂, nicknamed Tony, in Wherefore Art Thou, Pokémon?. Whitney has a Nidorina. She was easily defeated by Ash's Cyndaquil in their Gym Battle in A Goldenrod Opportunity. Temacu has a Nidorina which was first seen drinking out of a fountain in The Heartbreak of Brock. She is later seen taking a stroll with Temacu's Nidorino. A herd of Nidorina were first seen in The Flame Pokémon-athon!. Nidorina also appeared in the banned episode EP035. Nidorina also appeared in The Power of One, Celebi: Voice of the Forest, Arceus and the Jewel of Life and Zoroark: Master of Illusions. Two Nidorina were seen at Professor Oak's Laboratory in A Tent Situation. A Nidorina was one of the Pokémon seen at the Pokémon Swap Meet in Tricks of the Trade. A Nidorina was seen in the wild in The Legend of Thunder!. Multiple Nidorina appeared in the opening of Destiny Deoxys. 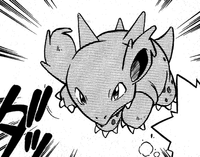 A Nidorina under the ownership of a Pokémon Coordinator appeared in Hi Ho Silver Wind!. A Coordinator's Nidorina appeared briefly in Spontaneous Combusken! participating in the Battle Stage of the Chrysanthemum Contest. A Nidorina appeared in SM003, as a silhouette. Green had a Nidoran♀ in Pokémon Adventures that evolved into a Nidorina some time between the Red, Green & Blue chapter and the round Valiant Venomoth! in the Yellow chapter. It evolved into a Nidoqueen in the FireRed & LeafGreen chapter. A Nidorina was seen in a Poké Ball at Elm's Laboratory in Off Course with Corsola. 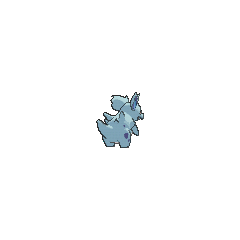 A Nidorina appeared in The Last Battle XIII as one of the Pokémon sent to help the fight in Ilex Forest. Nidorina and its pre-evolution share their category with their male counterparts Nidoran♂ and Nidorino. They are all known as the Poison Pin Pokémon.